Greetings from Rome! It had been my plan to send you greetings aer I had the opportunity to aend Pope Francis’ audience on Wednesday morning but just realized it has to be done and submitted earlier this week. So I just walked up to St. Peter’s Piazza and took this picture. It is the best I’ve got at the moment. It is Monday night as I write this and I wish I had more to tell you about right now. You know, you land a little tired to start with… and then you just walk. First, to St. Peter’s Piazza. Then today we went across the city through Piazza Navona, the Pantheon, a dozen churches, the Campdoglio, a dozen other churches, a tour of the Colloseum, a half dozen churches. We just ran into our seminarian, Joe Farrell, walking home from classes in one of the streets. Then a big plate of carbonara and tiramisu. Traveling is so difficult! 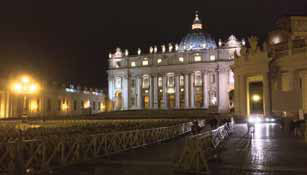 Tomorrow we hope to have Mass at a chapel in St. Peter’s Basilica. Then, guess what? Probably a dozen more churches tomorrow. It has been quite a long time since I had a vacation, and I’m grateful that you let me get away for a few days. For some, this kind of outreach threatens what they perceive as the noble dignity of the Church. It seems that some may think that the Church needs to stay more aloof, dress up and preserve the dignity of the greatness of the Church. As if such things were actually communicated in life by things. But it occurs to me—and this is why I’m so anxious to see him—that this Pope has begun to do and say things that haven’t been said so eloquently (simply) or profoundly (humbly) for about 2,000 years. And the One Who said them first is so evident in the one who speaks now. I pray this is true, and that we can all see a new way of life here. As one bishop told me shortly aer Francis’ election as Pope, the bishops of the Church – all of them – are challenged to reconsider many things, and to return to the roots of what all of this is about: a leadership that is Christ, nothing more, nothing less. It isn’t in the externals, or even the choice of words: it is in the action of love and the heart that lies at the root of this new evangelization. If I get a chance, I will certainly tell him you all said hello, and that we would love for him to come and visit us in Fredericksburg.